We eat a lot of salsa around our house. In fact, it is a good thing that I can my own or a large portion of our grocery budget would be dedicated to salsa. I remember when I first got married and salsa went on sale, I spent almost our entire grocery budget on salsa that month! No one complained. 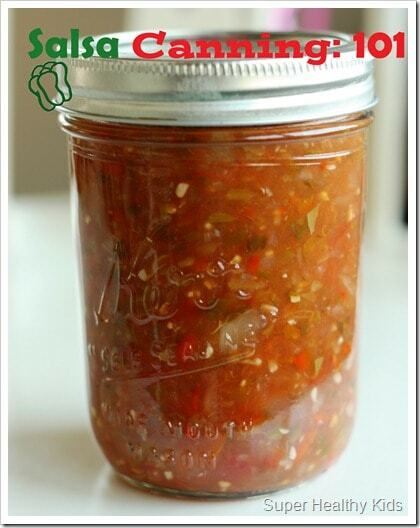 If you are new to canning, or a professional, salsa is a food that is great for everyone to try. 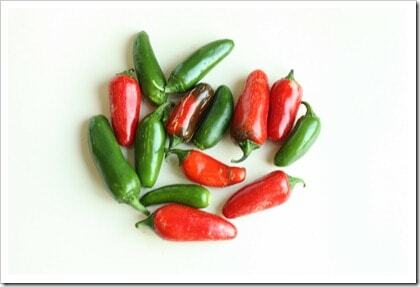 And It is economical if you grow your own peppers and tomatoes! You can make a jar of salsa for less than $1.00!! 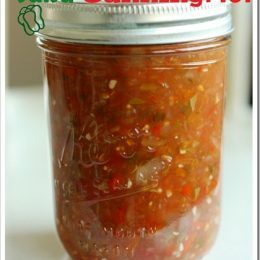 Note: This post is not intended to be a guide on canning, but a particular salsa recipe that I use that has been tested. I highly recommend going to other sites for information about canning. I do not develop any canning recipes, and I personally don’t recommend doing anything other than following a recipe from an official canning or USDA website for canning. Please seek answers regarding canning from other resources if you are not experienced in canning. Blanch, peel and roughly chop tomatoes. 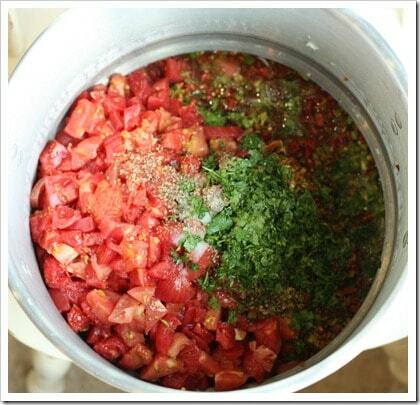 In a food processor, dice the bell peppers, cucumbers, jalapenos, onion, cilantro and garlic. Combine everything in a large stock pot. Ladle into clean, hot pint jars, leaving ½-inch headspace. 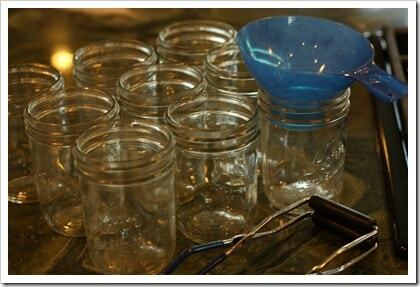 Wipe rims of jars with a dampened, clean paper towel; apply two-piece metal canning lids. Process in a boiling water canner according to your elevation. 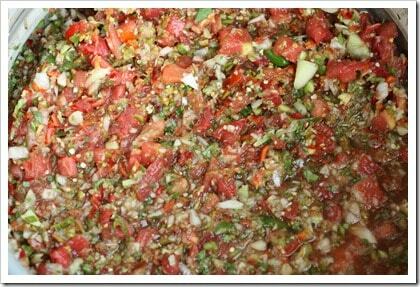 I love homemade salsa, but normally make small batches that we eat in a day or two. I have always left the peel on and have never cooked my salsa. Are these requirements for canning? Is it possible to can “fresh” salsa or do I need to boil it first? 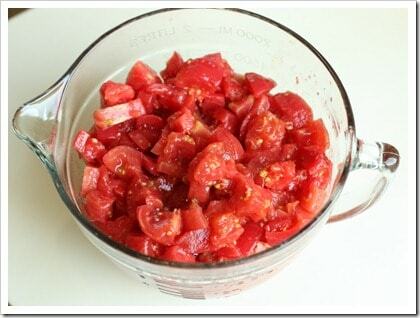 I have tons of tomatoes right now (with more coming) and would love to be able to use them all to make my salsa and can it. I have no canning experience. When you are canning, it is important to follow a tested recipe because the amount of vegetables you put in can change the acidity. This can effect if bacteria will grow in your product. If you have a local state extension service, you can call them and ask them questions about specific recipes you have. The cucumbers are listed in the ingredients but not mentioned in the directions… I am assuming they go in with the rest of the veggies… AND skinning these tomatoes… I have a Victorio Food Strainer-can I skip that part? Thanks! Dina – if you use your food strainer, then you definitely don’t have to peel them! That is actually one way I make spaghetti sauce. I just like my salsa chunkier. Looks great. Any way to approximate how many of each ingredient before chopping? 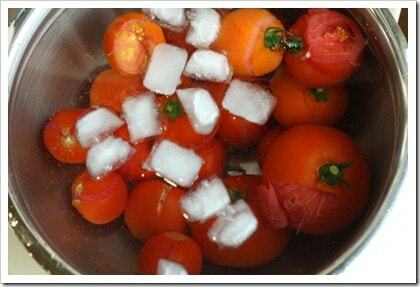 I’m not sure how many to buy/gather from the garden to make 14 cups tomatoes, or 4 cups of sweet peppers, for example. I’ve never canned anything before (why is it called “canning” anyways, and not “jarring” 😉 ) I’m going to freeze mine in pint jars. I like my salsa a little thicker, would it make a difference if I simmered it a little longer? Definitely. The longer you simmer, the thicker it will get. Do you peel your cucumbers? Yes I do peel the cucumbers. can you leave the cucumbers out of this recipe? This recipe has been tested for a specific acidity. I really can’t say if you leave the cucumbers out how it will change that. Since I always error on the safe side when canning, my response would be that I would follow the recipe as it is written. I want to add more cucumbers than tomatoes, I wonder if the cucumbers will stay crispy? i want to make a small batch of this to take to a party. Could you recommend amounts to use for that? I am nervous to do the whole canning thing but really want to try this recipe. If you are planning on canning the recipe, then I would probably not change this recipe because it is tested for a specific acidity. If you are just making it to eat, then definitely experiment and add more cucumbers! Just cut the recipe into 1/4 by dividing all of the ingredients by 4 and that should be a good amount to take to a party! How long will this last, Canned? If you properly can this and process for the correct amount of time according to your elevation, it will stay good for up to 2 years. If you don’t process this, and just put it in your fridge after you make it, then it should stay good for up to 2 weeks.